“Let’s Face the Music and Dance” is an episode about intimacy of all kinds: between parents and their children, husbands and wives, coworkers and friends. It’s also about the limits of intimacy and the importance of privacy even in close relationships. 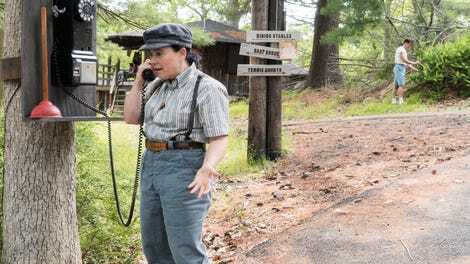 Before diving into the logistics of the episode, let’s just all take a moment to appreciate Alex Borstein’s portrayal of Susie Myerson, a woman with just as many hilarious zingers as Midge, but who is constantly relegated off center stage. Susie is a foil to Midge in so many ways: surly, rather than cheerful; short and compact, rather tall and lean; butch, rather than femme. Like Midge, Susie’s presence is something that is both cultivated, as well as a response to social roles. If Midge is constantly being underestimated because of her beauty and femininity, Susie is constantly being diminished by being mis-gendered or cast aside as someone who isn’t important enough to be noticed at all. Perhaps this is why it was so utterly charming to learn that Susie, inadvertently and through no effort on her part, has become a beloved member of the Steiner Resort staff. Somehow, by simply carrying a plunger around all summer, Susie has become part of the team. 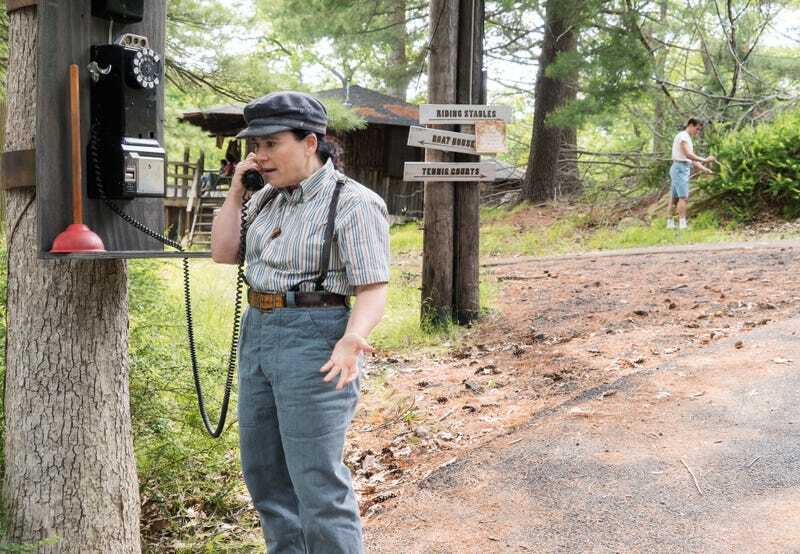 After spending the night at Midge’s house, Susie heads back to the staff quarters of Steiner, only to discover that the resort employees are desperately searching for her. When they learn she is back they cheer. They cover her in blankets and bring her soup. They welcome her home as a member of their team. Borstein’s deadpan expressions as Susie can convey everything from disbelief to fear, frustration, longing, and even pure tenderness. As a member of the Steiner family, Susie’s soft look of puzzlement gives way to something like pride. She even agrees to learn to dance with them for their final staff production! Sadly, Abe doesn’t fare nearly as well this episode. After bringing Midge and Susie home, he goes from giving both of them the silent treatment to letting Midge know in no uncertain terms that he doesn’t approve of her choices. Midge’s response to Abe’s confrontation is kind, but firm. You can see how talking out her reasons for getting into comedy with her father confirms that this is exactly what she wants. Abe may be an intellectual and a man of logic, but he is also a man with a lot of pride and seeing Midge on stage, behaving in ways that he finds repulsive, makes him feel as though he is losing control, “You have ruined tomato juice for me!” he bellows when Midge offers to get him a glass to calm him down. Still, Midge doesn’t back down. While she agrees to wait to tell Rose about her bourgeoning comedy career, she also agrees to do another gig without her father’s blessing or permission. Just before she leaves for her performance, Abe sees Midge in the black dress that has become her comedic uniform. They glance at one another and don’t say a word. As Midge leaves the room, the tiny black cape that hangs down the back of her elegant outfit makes her look like a superhero doing what duty calls for. Abe has other concerns beyond Midge this episode too. When Bell Labs calls to let him know that one of his projects is coming to fruition, he hurries back to New York with his son, eager to show off the importance of his work and to also try and get his son a job. As a tenured professor at Columbia, Abe is accustomed to getting what he wants, but he soon learns that he is actually far lower on the totem pole than his own son who, unbeknownst to him, has actually been working in a highly classified government job for years. Again, Abe’s pride is injured by the revelation that both of his children have secret lives, as well as the knowledge that he is no longer calling the big shots about what happens in his own family. Still, even though Abe feels diminished by all this new information, it’s evident that this new knowledge doesn’t actually change much in terms of family dynamics—his grown children are clearly still devoted to him, and his wife is a true partner, even willing to scheme along with him in order to find out more information about their son. While last season, Midge and Joel’s relationship was marred by secrets, their separation this season has actually encouraged a new kind of honesty, one that allows them to be more tender towards each other. After all they’ve been through, they finally see each other for who they are, and are slowly getting to the place where they can actually talk in a way that feel natural, rather than guarded. Still, it was sad to see Midge and Joel share one last dance at Steiner, especially when they have come so far in learning to be supportive of one another. They drift closer and closer together until Joel says he thinks it’s time they dance with someone else and we see them almost naturally glide away, twirling into the arms of other people. The largely orchestrated roles they played for one another, the strong, family provider and perfect, supportive little housewife, are over. There are no secrets anymore between Midge and Joel, but that also means there are less romantic fictions they can now pin their hopes to.